Consider the telephone handset icon, in particular. When was the last time you used a phone that looked like this? The widespread use of cell phones has made the traditional handset icon anachronistic. Chances are, the only handsets you’ve seen lately were in an office. The truth is, a generation is coming that will only know the telephone as a pocket-sized rectangle with a touch screen and bluetooth that is used to send text messages. Nevertheless, for decades to come, we will look at the handset icon and still recognize it as the universal symbol for the telephone. In the same way that the handset has come to stand for “telephone,” the 1955-57 Chevrolet has come to stand for “car.” The chrome, the tail fins, the curves… they are all instantly recognizable. The Tri-Five’s ubiquitous presence at car shows, cruise-ins, drag strips, and two lane blacktops all across the country have made it a symbol for automobiles; an icon in its own right. 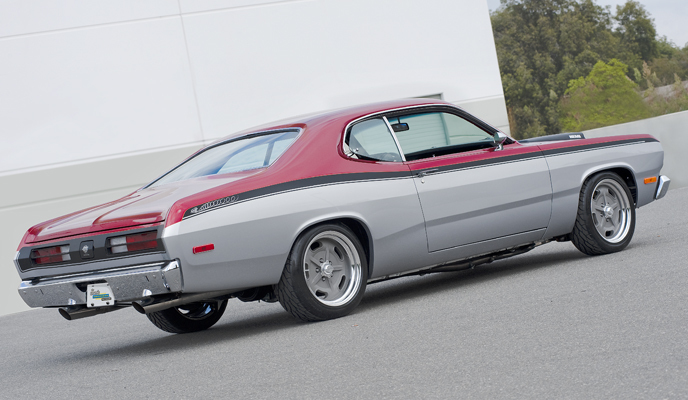 Classic Industries teamed up with SpeedTV’s “Chop, Cut, Rebuild” for the television show’s 8th season in 2011 and unveiled a one-of-a-kind 1972 Plymouth Duster that showcased Classic Industries’ depth of parts offering for the catalog it debuted earlier in the year. The Duster, built alongside a 1941 Willy’s, made its first major public debut at SEMA, a gathering and trade show for the manufacturers and retailers in the automotive aftermarket.